Just to let you know that the trip you arranged in Cancun was absolutely perfect! Enrique is very helpful and professional, and is an extremely compitent fly fisherman as well as with conventional tackle. Pick up was on time, lunch was included and good. The fishing was spectacular! In two days I hooked about 15 Tarpon in the 4lb to 25lb class (boated only five), and about 30 Snook in the 2lb to 10lb class. All on artificials and light tackle. What a wonderful day of fishing in Cancun....in October! 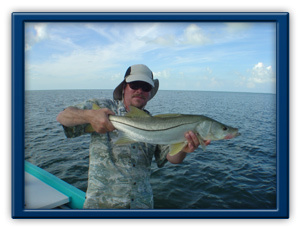 Some say the fishing slows this time of year but that myth is dispelled with guide Enrique at Cancun Flats Fishing. Fishing light tackle and artificial feathers, I landed about 15 small Tarpon and 4 Permit! I must have missed another 20-30 fish throughout the day. The Permit were schooling on the flats! I highly recommend a day of fishing with Enrique to experience some of the best light tackle fishing in Mexico! We would like to thank you for the great days of fishing! We caught 4 Tarpon, 6 Snook, and had several shots at some Permit. Enrique worked very hard and gave us everything we hoped for in a guide. We'll be back! Thanks so much to you and Enrique for a very fun morning of fishing last Sunday! My wife Melissa and I had a great time. I really would have liked to spend the rest of the day fishing with Enrique, but it was our last day in Cancun and we had a few other things to do. We learned a lot from him and caught some beautiful fish. We'll definitely be coming back to Cancun in the next six months, I will contact you in advance so we can make some plans for some more fishing. Thanks again and pass my regards and thanks to Enrique. Great fishing! I am look forward to coming back and fishing in June. Please email me the pictures Enrique took also if you could. I have fished with guides in Montana and Florida and Enrique is among the best. He is a very knowledgeable guide and translated his knowledge of the fish and flyfishing to me with ease. I was always in a good position to make a cast. More importantly, Enrique was one of the most pleasant guides that I have fished with. As for the area, we fished the Isla Blanca and did not see another boat the whole day! The Isla Blanca lagoon is like what Southwestern Florida must have been like 100 years ago. We had a great time with Enrique and I highly recommend him and a day (or more if you have it) at La Isla Blanca. Gracias otra vez para el gran tiempo contigo y feliz Navidad!